Ashtabula County [æʃtəˈbjuːlə] is the northeasternmost county in the U.S. state of Ohio. As of the 2010 census, the population was 101,497. The county seat is Jefferson. The county was created in 1808 and later organized in 1811. The name Ashtabula derives from Lenape language ashte-pihële, 'always enough (fish) to go around, to be given away'; contraction from apchi 'always' + tepi 'enough' + hële (verb of motion). Ashtabula County comprises the Ashtabula, OH Micropolitan Statistical Area, which is also included in the Cleveland–Akron–Canton, OH Combined Statistical Area. The county is probably best known for having nineteen covered bridges within the county limits, including both the longest and the shortest covered bridges in the United States. Grapes are a popular crop and there are several award-winning wineries in the region owing to the favorable microclimate created by the nearby lake. During the winter, Ashtabula County (along with neighboring Geauga and Lake Counties, as well as Crawford and Erie Counties in neighboring Pennsylvania) receives frequent lake-effect snow and is part of the Southeastern Lake Erie Snowbelt. After Europeans arrived in the Americas, the land that became Ashtabula County was originally part of the French colony of Canada (New France), which was ceded in 1763 to Great Britain and renamed Province of Quebec. In the late 18th century the land became part of the Connecticut Western Reserve in the Northwest Territory, then was purchased by the Connecticut Land Company in 1795. According to the U.S. Census Bureau, the county has a total area of 1,368 square miles (3,540 km2), of which 702 square miles (1,820 km2) is land and 666 square miles (1,720 km2) (49%) is water. It is the largest county in Ohio by area. Across Lake Erie lie Elgin and Norfolk Counties, Ontario, Canada (north). As of the census of 2000, there were 102,728 people, 39,397 households, and 27,774 families residing in the county. The population density was 146 people per square mile (56/km²). There were 43,792 housing units at an average density of 62 per square mile (24/km²). The racial makeup of the county was 94.07% White, 3.16% Black or African American, 0.19% Native American, 0.34% Asian, 0.02% Pacific Islander, 0.85% from other races, and 1.36% from two or more races. 2.23% of the population were Hispanic or Latino of any race. 19.3% were of German, 11.6% Italian, 10.6% English, 10.5% Irish, and 10.3% American ancestry according to Census 2000. 95.2% spoke English, 2.4% Spanish, and 0.8% German as their first language. There were 39,397 households out of which 32.40% had children under the age of 18 living with them, 54.80% were married couples living together, 11.40% had a female householder with no husband present, and 29.50% were non-families. 24.80% of all households were made up of individuals and 10.70% had someone living alone who was 65 years of age or older. The average household size was 2.56 and the average family size was 3.05. In the county, the population was spread out with 26.20% under the age of 18, 7.60% from 18 to 24, 28.00% from 25 to 44, 23.60% from 45 to 64, and 14.70% who were 65 years of age or older. The median age was 38 years. For every 100 females there were 95.10 males. For every 100 females age 18 and over, there were 92.10 males. The median income for a household in the county was $35,607, and the median income for a family was $42,449. Males had a median income of $33,105 versus $22,624 for females. The per capita income for the county was $16,814. About 9.20% of families and 12.10% of the population were below the poverty line, including 17.10% of those under age 18 and 8.60% of those age 65 or over. As of the 2010 United States Census, there were 101,497 people, 39,363 households, and 26,495 families residing in the county. The population density was 144.6 inhabitants per square mile (55.8/km2). There were 46,099 housing units at an average density of 65.7 per square mile (25.4/km2). The racial makeup of the county was 92.7% white, 3.5% black or African American, 0.4% Asian, 0.2% American Indian, 1.1% from other races, and 2.1% from two or more races. Those of Hispanic or Latino origin made up 3.4% of the population. In terms of ancestry, 24.9% were German, 15.8% were Irish, 12.6% were English, 11.1% were Italian, 10.0% were American, and 5.8% were Polish. Of the 39,363 households, 31.3% had children under the age of 18 living with them, 49.2% were married couples living together, 12.4% had a female householder with no husband present, 32.7% were non-families, and 26.9% of all households were made up of individuals. The average household size was 2.50 and the average family size was 3.01. The median age was 41.0 years. The median income for a household in the county was $42,139 and the median income for a family was $50,227. Males had a median income of $40,879 versus $30,156 for females. The per capita income for the county was $19,898. About 11.8% of families and 15.7% of the population were below the poverty line, including 21.7% of those under age 18 and 9.2% of those age 65 or over. 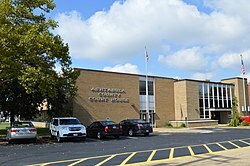 Ashtabula County had voted for the Democratic candidate for president in every election between 1988–2012; however, in 2016 it voted for Donald Trump. Trump captured the largest majority in the county since President Nixon in 1972 & he is also the first Republican presidential candidate to carry Ashtabula County since 1984. Trump is also the first candidate to speak in the county since John F. Kennedy. Ashtabula County (along with neighboring Lake County) fostered a very large Finnish American community around the turn of the twentieth century, and as a result, the area is home to many Finnish Americans. Ashtabula County has eighteen extant covered bridges. Of these, nine were constructed prior to 1900. See List of Ashtabula County covered bridges. Tammy Cochran, country music singer from Austinburg; biggest hit was "Angels in Waiting"
Francis Joseph Hall, was an American Protestant Episcopal theologian and author. ^ Cross, Tom (2008). Fishing Ohio: An Angler's Guide to Over 200 Fishing Spots in the Buckeye State. Lyons Press. p. 112. ISBN 978-0-7627-4326-1. ^ Mahr, August C. (November 1959). "Practical Reasons for Algonkian Indian Stream and Place Names". Ohio Journal of Science. 59 (6): 365–375. ISSN 0030-0950. Retrieved August 3, 2016. ^ "apchi". Lenape Talking Dictionary. Retrieved August 3, 2016. ^ "tèpihële". Lenape Talking Dictionary. Retrieved August 3, 2016. ^ "Ferrante Winery brings home the gold". The Ashtabula Wave. Retrieved April 1, 2016. ^ "Ashtabula, Lake are Ohio's largest and smallest counties by area". cleveland.com. January 18, 2011. Retrieved December 30, 2015. ^ Leip, David. "Dave Leip's Atlas of U.S. Presidential Elections". uselectionatlas.org. Retrieved March 21, 2018. ^ "Chester Hardy Aldrich". Find A Grave. Retrieved September 29, 2012. Wikivoyage has a travel guide for Ashtabula County.